Representatives Dr. Dre and Snoop Dogg plan to discuss logistics for a tour involving the two performers and the virtual Tupac, according to a person familiar with the discussions. One option would be a tour in stadiums, involving other hip-hop stars, including Eminem, 50 Cent and Wiz Khalifa. Alternately, they could stage a more limited tour, featuring only Dre, Snoop Dogg and the virtual Tupac, in smaller arenas. The Hologram performed Hail Mary and 2 of Amerikka's Most Wanted" with Snoop and Dre and was definitely the most talked about moment of the entire Coachella festival. Tupac Shakur was murdered in Las Vegas at the age of 25 in an unsolved shooting, and sold more albums in his death than in his life. With many unreleased recordings he made while living being released all the time it has lead many to believe he is still living. This has created many conspiracy theories about his death. With people actually believing he's still alive is what also adds to the cloud of mystery that makes millions love Tupac Shakur. 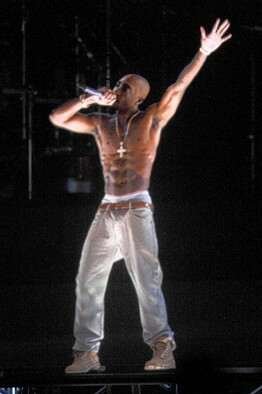 His mother Afeni Shakur did approve of the hologram of her son and loved the performance. In return, Dr. Dre made a donation to The Tupac Amaru Shakur Foundation.